The Pattern Properties dialog can be opened from the Pattern Editor, e.g. by clicking the question mark icon in the toolbar or by clicking the pattern number in the upper-left corner of the pattern display (#0 or similar). It is not available for MOD and S3M files, as the pattern length is fixed in those formats. To change the number of rows in the pattern, either type the number into the text field, or click on the menu arrow to choose from a list. Pattern lengths from 1 to 1024 rows are supported. To quickly halve or double the number of rows, click on the “/2” or “x2” buttons. If you are reducing the number of rows, and there is event data in the rows that are being deleted, you will be alerted that this data will be lost, and you can back out if necessary. 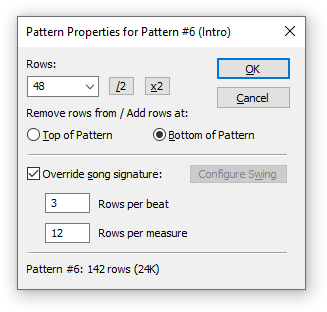 For MPTM tracks, you can enable per-pattern Time Signatures by setting the “Override” checkbox. Then enter the Rows per Beat and Rows per Measure values that you want to apply to this pattern only. At the bottom is a reminder of the pattern you are modifying, the current number of rows, and the amount of memory it consumes. This page was last edited on 29 March 2017, at 20:52.